It is intended to be easy to use, implemented as a new camera type and two new camera attributes. Of course it does require that the source code is modified and built for your favourite platform. It creates optimal quality stereo pairs intended to give minimal eye strain for projected stereo images, for example, sequences for computer generated movies. This is in contrast to much of the stereo that is generated that can only be tolerated by using eye tricks or viewed for short periods. 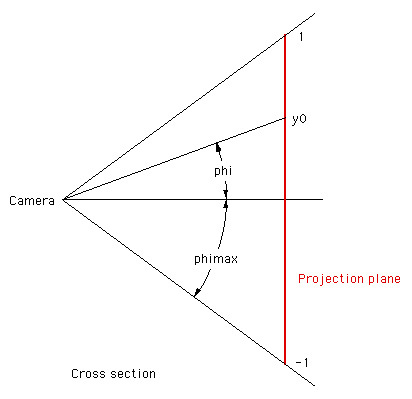 The stereo camera is defined the same as a perspective camera with two additional attributes, namely the distance to zero parallax and the eye separation. Compared to the many ways one can define a stereo camera, these are the most intuitive and natural ways for a stereo content developer to think about stereo composition. The stereoscopic camera here implements an off-axis frustum camera, see figure above. The view direction of the cameras are parallel, as such there is no vertical parallax. 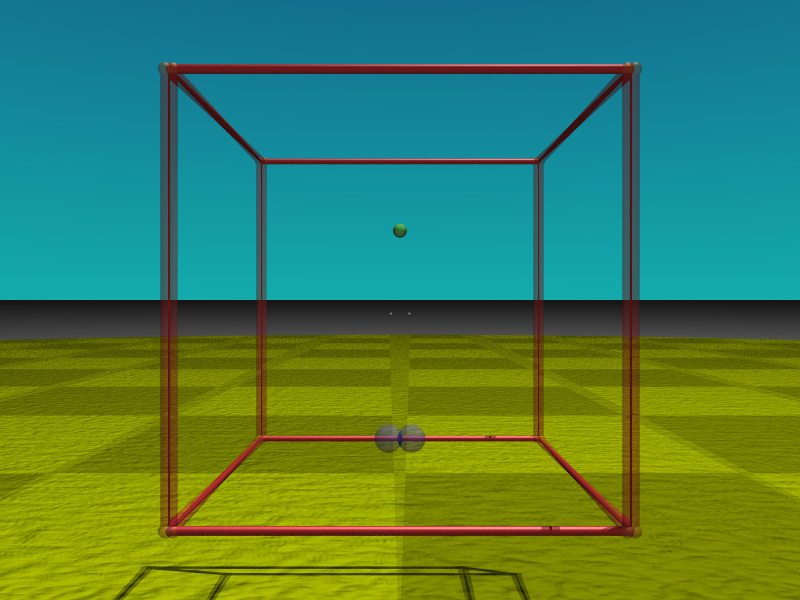 Implementing the stereoscopic camera for each eye is as straightforward as creating a camera definition as follows. Normally the scene would be rendered twice, one for each eye corresponding to the "eyeoffset" value, negative for the left eye and positive for the right eye. 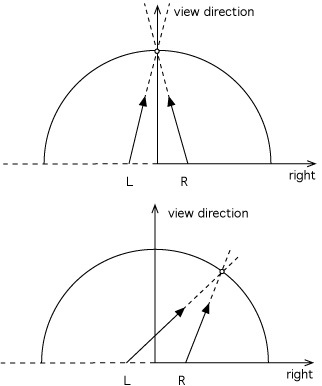 Note the eye offset is defined as how far along the "right" vector to move the camera, as such it is half the eye separation. The zero parallax distance defines the distance away from the camera at which objects will appear to be at zero parallax. If the eyeoffset is set to zero then the result will be the same as a perspective camera. If the reader is unfamiliar with this and other aspects of stereoscopic composition there is more information here as well as notes on stereoscopic projection/viewing/generation given here. This section is mainly for my own reference but may also be helpful for other who wish to add another camera type. The basic idea is to shift the camera to the left and right for each eye and then add a offset to each camera ray such that the two projection planes are coincident. In order to achieve this a new camera type needs to be added, along with support for the new parameters, and of course the camera implementation itself. The source files from the 3.6.1 UNIX distribution that have been modified are included here: source.zip, in each case the changes made have been commented with the string "pdb", so search for this to see the only changes made. More detail on what is changed is listed below. If you are running this version and want to use this camera then it should simply be a matter of replacing these files in the PovRay distribution source directory and recompiling PovRay. Define another camera type in "camera.h" and add additional parameters to the definition of "Camera_Struct". Add token names for the camera type and additional parameters in "parse.h". In this case three new tokens. Add new tokens to the "Reserved_Words" list in "tokenize.cpp". Add appropriate support for the tokens in "parse.cpp". And finally, the real work is performed in "render.cpp" where the primary ray is defined for any position (x,y) on the image plane. In this case since the camera is offset the primary ray is defined by a modified position "Ray->Initial" and direction "Ray->Direction". Note that the ray is shifted in the opposite direction to the direction the camera is shifted. // Normalised projection plane coordinates from -0.5 to 0.5. A very precisely created test scene has been created to test this and other cameras. 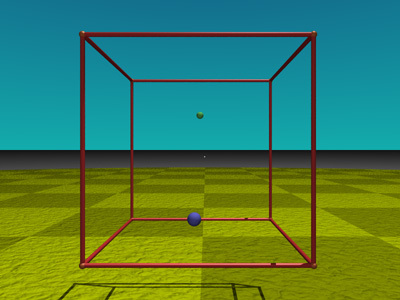 It is a cube (sides 1 unit) placed 2 units (same as the distance to zero parallax) from the camera. 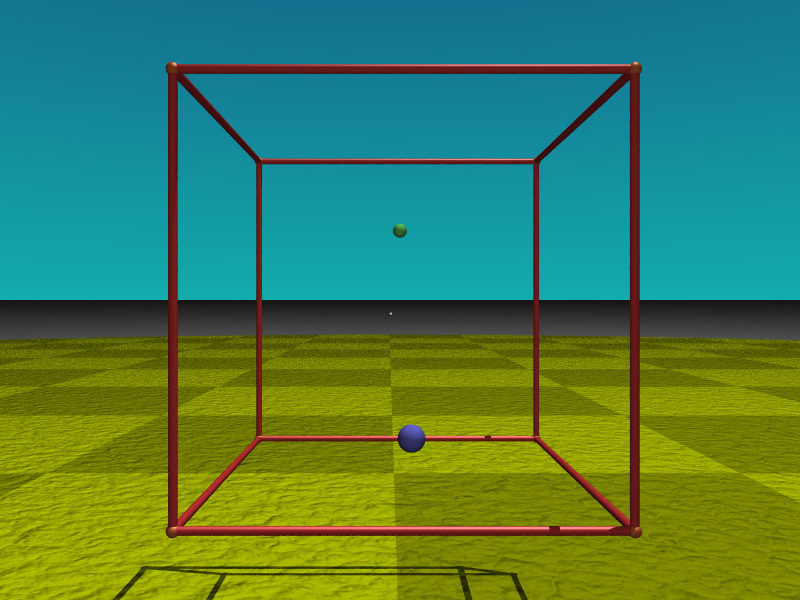 There are three small spheres, the green sphere is 2 unit away so should have no parallax. The blue sphere is 1 unit away so should have parallax equal to the camera separation which is also the same as the parallax at infinity but opposite sign. 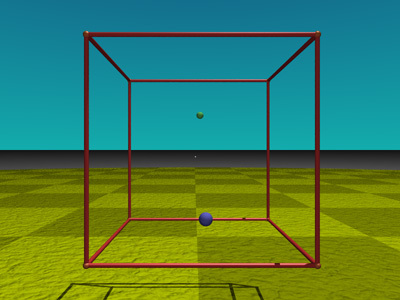 The white sphere is 10 units away and approximates parallax at infinity. Alternatively by overlaying the images with a 50% transparency one should be able to verify the correct stereoscopic relationships, for example, the correct positive and negative parallax for each component. A stereoscopic panoramic image is a very precise projection intended for full or partial cylindrical projection environments, such as the AVIE. They have the benefit over most surround stereoscopic displays in that the viewer may look in any direction and the stereoscopic effect is achieved without any head tracking. To a close approximation it also means that multiple people can inhabit a full 360 degree stereoscopic display, each looking in a different direction, something that is not possible with standard flat wall surround stereoscopic displays. For more information see this page. e' = e fo / sqrt(fo2 - e2). phimax = atan(imageheight pi / imagewidth). Most of the comments for the stereoscopic perspective discussion also apply here so won't be repeated. 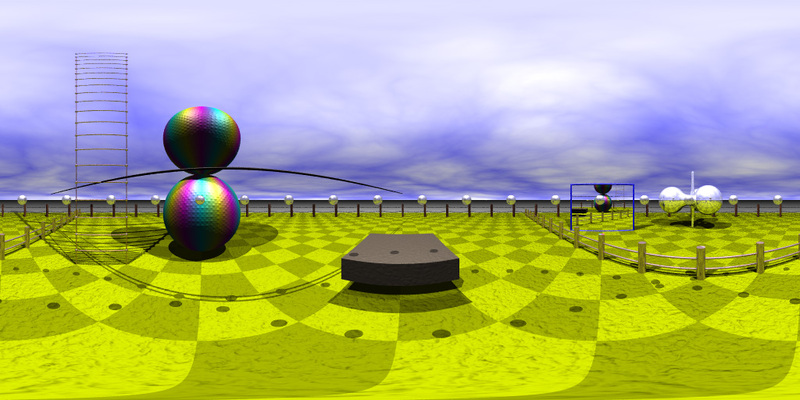 As for the stereoscopic perspective case, another very precise scene is designed that results in the following images. The small spheres around the middle of the image should appear exactly at zero parallax. When viewed correctly the spheres should all appear round. 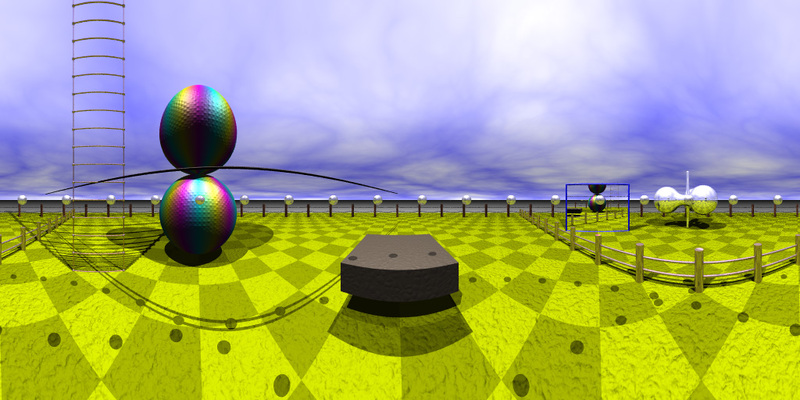 When viewed correctly the spheres should all appear round. 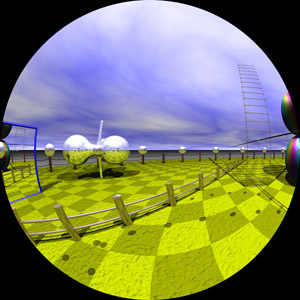 The small spheres along the horizon should be at zero parallax. 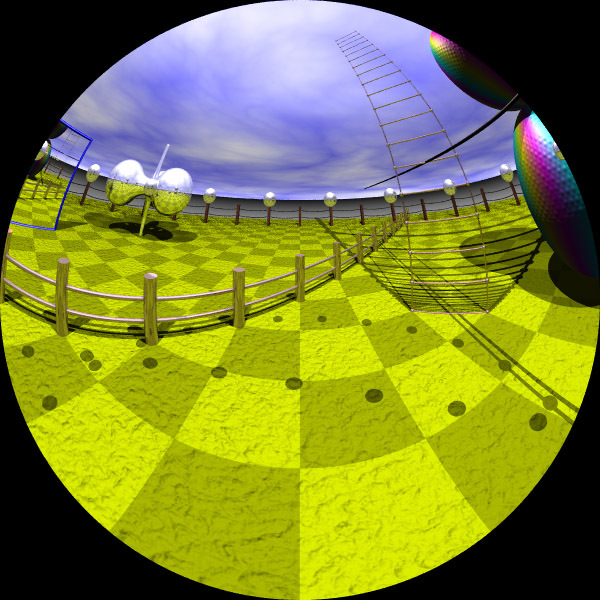 There are two situations where a so called offset fisheye projection is required. 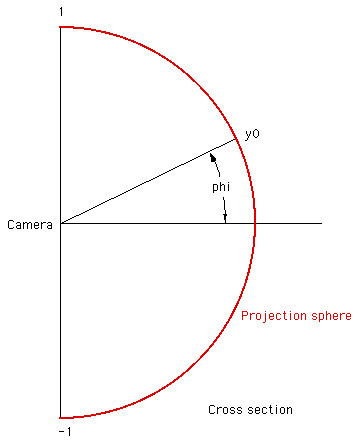 One arises when projecting using a fisheye lens on a data projector into a hemispherical display and one wishes to place the projector at a location other than the center of the hemisphere. This can simply be achieved with an image warping at projection time and does not require a different rendering. 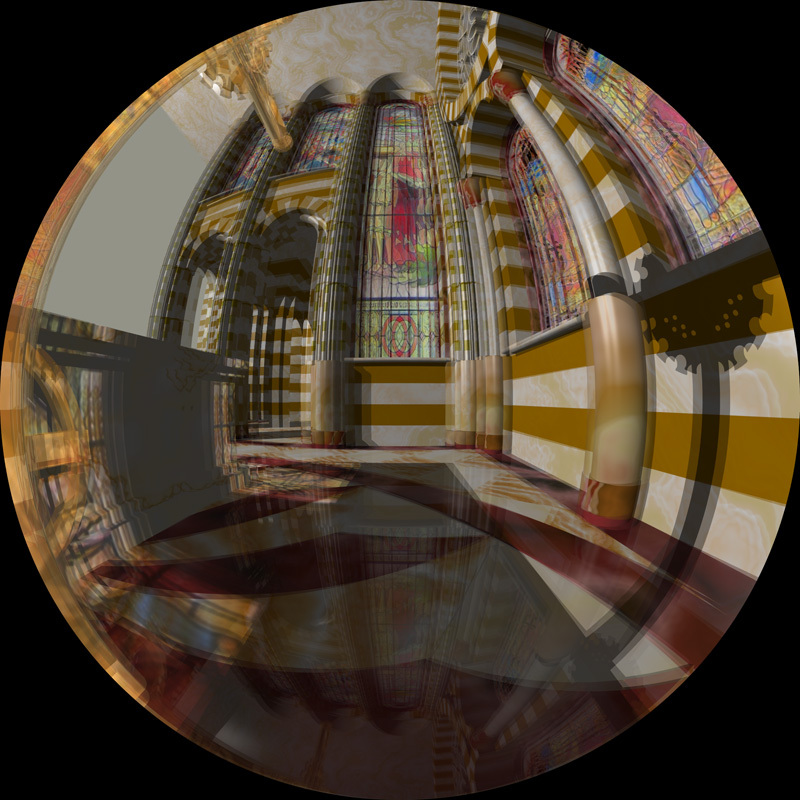 The other situation is when the viewer is not at the center of the dome, while this can also be approximated by a image warping process, for strictly correct results it requires a different rendering in order to capture the true parallax information. 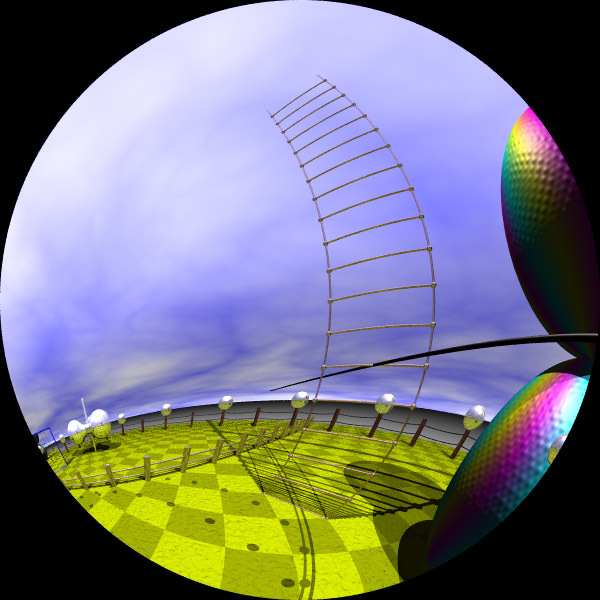 pdb - Offset fisheye for planetariums with a shifted sweet spot. Essentially just translates the view vector in the plane of the hemisphere. // If the pixel lies outside the unit circle no ray is traced. 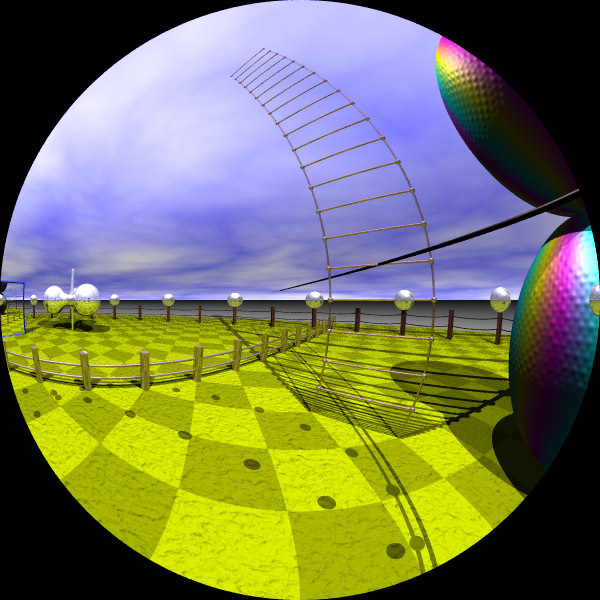 There are a number of ways one may imagine creating a stereoscopic fisheye pair. 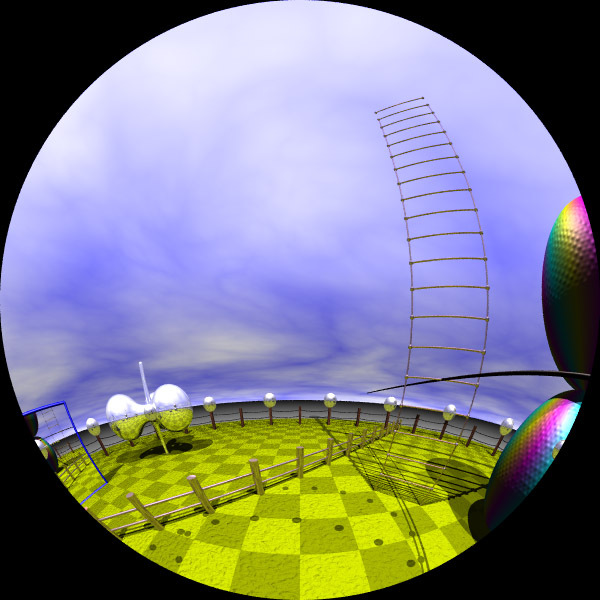 Perhaps the first idea would be take two normal fisheye projections and toe them in such that zero parallax is positioned correctly along the view direction. This leads to incorrect parallax estimation in a number of regions, particularly at the north and south pole, but there is also a mismatch at the edges. 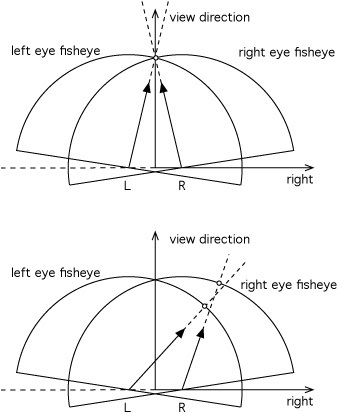 The next approach might be to imagine the eyes fixed and the fisheye projection surfaces coincident but the view vector is modified for each camera, similar to an offset fisheye. 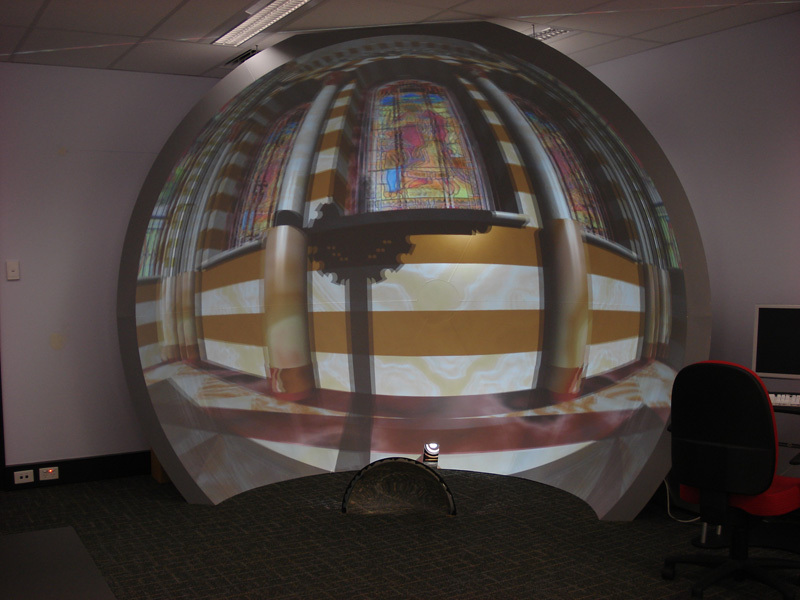 This is the first stereo fisheye projection implemented as a new camera "stereofisheye1". As it happens this is appropriate if the viewer is largely looking forward along a vertical line. The parallax information does disappear towards the sides of the dome. For many applications this may not be a problem, as long as one is using the sides for peripheral vision support and not for depth cues. The last approach presented here is called an omni-directional stereoscopic fisheye pair. Omni-directional because it allows the observer to look in any direction (as long as there is a constant "up" vector) and get correct parallax information. This has been implemented as a new camera type called "stereofisheye2". 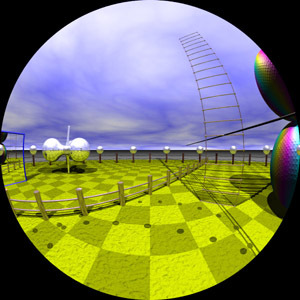 This is very similar in principle to omni-directional stereoscopic panoramic images as well as to the stereoscopic spherical projections discussed earlier. Note that if stereoscopic spherical projections are created then stereoscopic fisheye projections can be derived from for any view direction, this provides the opportunity for interactive panning within a dome environment. 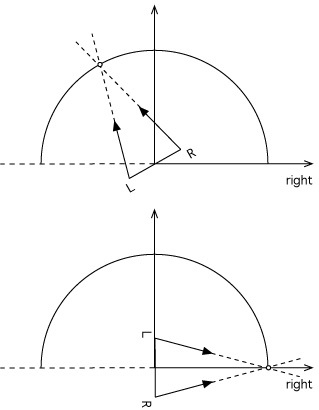 Note that while the tests above have been designed for an upright dome, modifying the projections is straightforward for an inclined or perfectly horizontal dome.